Migrating to S/4 from SAP R/3® or another ERP application provides you with a sound platform for your mySAP® and e-Business environments. Using IM4.0, you can quickly and easily develop interfaces to and from your R/3 application and substantially reduce the amount of maintenance required. Its flexible and intuitive user interface makes IM4.0 Xchange easy to use and quick to learn. – Direct data exchange between S/4 and third-party systems (More than 100 different connectors to operating systems, DBMS and ERP applications). The high-performance interface solution is successfully used by more than 40 of the world’s largest corporations. In a live environment, IM4.0 monitors and controls all of the interface processes. Intelligent error management not only notifies the system administrator in the event of an error, it also supports active data correction. SSL (Secure Socket Layer) encryption ensures that data is safely transmitted. 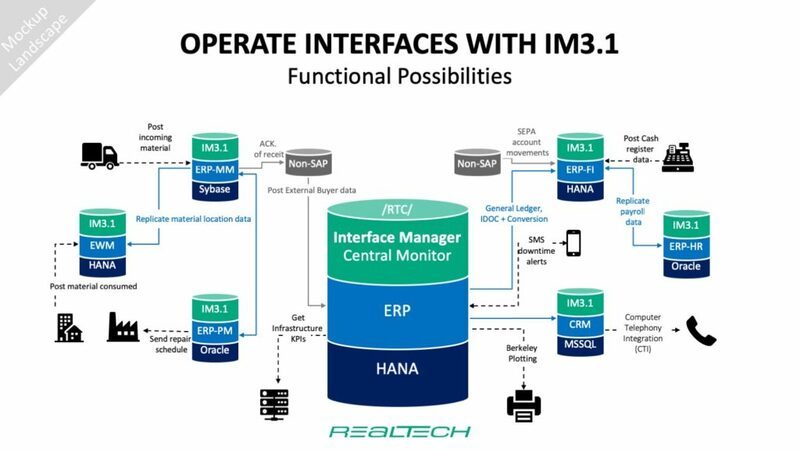 IM/3 provides you with the information you need about all of your S/4 interfaces in a clear overview, enabling you to control, analyze and correct all of the data flows and processes. IM4.0 and IM4.0 Xchange give you the flexibility you need to effectively manage your interface processes. Almost every system – and even future technology – can be integrated, making your investment more than secure. Interface management requires sound expertise. As a mySAP partner and the leader in S/4 technology consulting, we put all of our project experience and development knowledge into our software duo IM4.0 and IM4.0 Xchange.